Sterile Processing Technician | Stellar Career College| Modesto, CA. Make a difference with a career in healthcare. This certificate program trains you to become a Sterile Processing Technician, where you will play an important role in patient care by preventing infections. 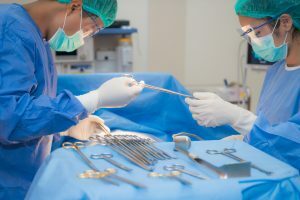 In this program, you will learn how to sterilize medical instruments, learn basic surgical instrumentation and medical terminology as well as decontamination and sterilization processes. Demonstrate basic technical skills in managing the process for surgical instrumentation sterilization, inventory control and supply chain management, and information technology as it relates to the sterile processing environment. Demonstrate professional behaviors of caring, accountability, responsibility, respect for the quality care of patients, acceptable attitude and attire, and organization and time management skills. Work independently in a team of central sterile processing technicians who are collaborating to maintain sterilization and storage. Utilize critical thinking skills as a basis for clinical judgment and anticipatory decision making when managing all tasks related to sterile processing. Contact us today to find out how to get started and on your way to a rewarding career! Upon successful completion of the program, graduates will receive a certificate of achievement. This program is designed to prepare graduates to pursue entry-level employment in the field, or jobs in related fields, the specific job titles of which may not be represented in the program title or described above. Although the School will assist students with job placement, finding a job is the individual responsibility of the student. The School does not guarantee that any student will be placed in any of the jobs described, or placed at all. Graduates of the program are qualified and encouraged to take the Certification Board for Sterile Processing and Distribution’s (CBSPD) Sterile Processing Distribution (SPD) certification exam. Tuition includes a prep course and one exam attempt fee.